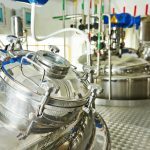 Spectac International know that manufacturing industrial pharmaceutical vessels to be durable and resistant is highly important for the pharma sector. Spectac International have unrivalled knowledge in the pharma industry with the trusted expertise to deliver pharmaceutical vessels tailored to your specific requirements. Our skilled engineering team can build custom industrial pharmaceutical vessels of the highest quality that maximises production and output while minimising overall costs. 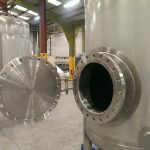 Stainless Steel: We fabricate our vessels using high-grade stainless steel that goes through a rigorous testing process. Stainless steel is ideal for this industry as it is non-porous and is corrosion resistant. Stainless steel is also tough and durable meaning it will serve a long life. Limpet coils with agitators: Pharmaceutical vessels can be used to bring materials to a high temperature and therefore require limpet coils with agitators. These are fitted to the vessels as a means of heating or cooling the vessels contents. Temperature regulators: Insulation, cladding and PLC systems can all be fitted to make the most efficient use of energy in regulating the vessel’s temperature. Maintenance: Effective cleaning is essential to maintaining the integrity of the process and in the prevention of corrosion. 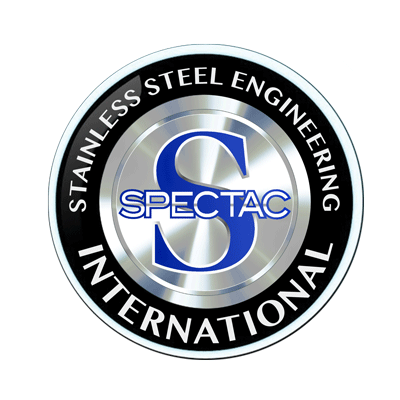 Spectac International provide comprehensive maintenance services for all of our stainless steel equipment to ensure that equipment is regularly maintained to the high-quality standards required for the manufacture of pharmaceuticals. Because stainless steel reacts with very few chemicals, it means almost any cleaning solution can be used on it. Spectac International can plan, design and transform production processes to enable companies to save time, reduce costs, minimise lead times and maintain a competitive advantage in the marketplace. We offer CE marking for all our manufactured products. Spectac International have completed a range of projects for clients in the pharmaceutical industry, that are meticulously planned, tailored, project managed and delivered on time. These projects would include the manufacture of aseptic vessels, clean-in-place vessels and fermenting vessels.